What are we doing in the next few weeks? Open to anyone aged between 7 and 11 years of age. All activities undertaken on the day will not only teach about aspects of theatre, but also encourage confidence building, making friends, and group work. The taster day will run from 10am until 2pm, with a break for lunch at 12 noon. Please could all attendees bring a packed lunch. Due to the knock-on effect of other productions, as well as personal commitments of the Directors, it is with regret that we must inform you that the decision has been made to postpone the pantomime until next year. We want the production to be as wonderful and professional as possible, and not rushed in any way. It has been agreed that rehearsals will start in July 2019. (this covers your insurance with Bridgend Castle Players). Rehearsal fees are also required, at £1 per rehearsal. Below are a collection of photographs taken at Coytrahen Community Centre in 2014, where our Chairman (Mark Davies) along with representatives from Llangynwyd Lower Community Council and the Coytrahen Communiny Association presented cheques for £200 each to SSAFA and the Royal British Legion after a very successful Armistice show in the community centre. We would like to thank all those involved in the show and it's organisation for their help and support for these very worthwhile causes. Our sincere thanks also go out to Mr. Peter Drake, the author of the short play presented that evening for the very kind donation of his royalties to the nominated charities. 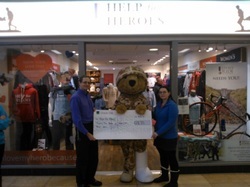 We presented Help for Heroes with a cheque for £25.35. This was the result of fund-raising from the Armistice Production that was performed at the United Services Club, Bridgend, in November 2013. Glamorgan Drama League One-Act Festival, Bridgend. 2013. Our Current Chairman (Mark Davies : Left) presents Ieuan Briers (Right) with the Adjudicator's Award from the Glamorgan Drama League One-Act festival. The Adjudicator had chosen Ieuan to receive the award due to his community spirit. He showed a great ability to play a small supporting role on one evening and then jump to a leading comedy role the next. The adjudicator also commented on the ease at which he moved from the one role to the other. Also, Mark Davies & Martin Brawn were nominated for the best comedy performance award for their parts in the shows. Congratulations Ieuan from all of us at Bridgend Castle Players. We would also like to take this opportunity to congratulate all of the other groups that entered into this year's festival. Together, we created a 3-day entertainment event that will be hard to beat! Good luck to all the groups in the Wales Finals!